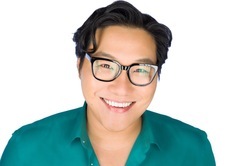 Oscar Seung hails from Lausanne, Switzerland and is a Dallas-based actor, opera singer, violinist, pianist, and conductor. Oscar is proud to represent Asian-Americans in theater, film, voice overs, and national commercials. In an effort to combat misrepresentation and underrepresentation of Asian-Americans in the arts, he created/produced/ and stars in American Dynasty - it will hopefully be the first Asian-American drama on television. The project has been screened at over a dozen domestic/international film festivals and won Audience Favorite at the Houston Asian American Film Festival, Best Screenplay at the Largo Film Awards, Best Domestic Short nomination at the Fort Worth Indie Showcase, and Best Actor nomination for Oscar at the Ouchy Film Festival. Voice over credits include Yuri!!! on Ice (Seung-Gil Lee), Touken Ranbu: Hanamaru (Kasen Kanesada), Show By Rock!! (Oboro), All Out!! (Yutaka Shinshi), Shounen Maid (Ibuki), One Piece (Daruma), Prince of Stride: Alternative (Nanpei Aoba), Fairy Tail, The Heroic Legend of Arslan, Garo: Crimson Moon, SHIMONETA: A Boring World Where the Concept of Dirty Jokes Doesn't Exist.